There are many myths on Spacewar! and not of all them can be verified. This is quite opposed to the view of Steve Russell doing this quite on his own and then the hackers taking over. Additionally, there were actually two “external” contributions, the “Expensive Planetarium” by Peter Samson (who’s involvement might have been reaching further than this), an isolated program to be called as a subroutine, and the code relating to the gravitational star by Dan Edwards. The latter one is notably well integrated into the main code, hinting to a consent on this integration by Steve Russell and Dan Edwards (as described in “Origin of Spacewar”). On the outline compiler (also by Dan Edwards): Please note that this is maintaining the configurable outlines. (The compiler is just skipping the branching over a dispatch table that would have been performed by the earlier outline interpreter for each of the 43 display commands for each of the ships in each display cycle.) – Cf: http://www.masswerk.at/spacewar/inside/insidespacewar-pt4-oc.html – Related to this, there’s another myth to be clarified: The tense memory conditions. Actually, there’s plenty of room left, some of it reserved for future patches, but even then, there’s memory left to run DDT in parallel (but you would have to set a flag, instructing the game to compile outline code for just a single outline, resulting in a game with two “wedges” on the scope). Regarding the timeline of events: Control boxes were probably introduced quite early (still in 1961, even before the outline compiler was coded). 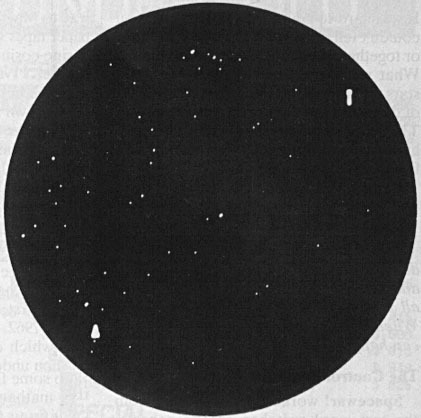 Some confusion might have arisen here from an obvious error in the page-arrangement in the original “Origin of Spacewar” article in Creative Computing. (Compare this to the arrangement in the “The Computer Museum Report”, fall issue 1983.) Even then, there are some discrepancies regarding the timing as provided in Steve Russell’s oral history interview and as described in “Origin of Spacewar” by Martin Graetz. Since Graetz claims to have checked the order of events with all participants and his account was nearer in time (by some 20 years) to the actual proceedings, we are probably encouraged to trust this source a little more. Regarding Russell’s presence at MIT in fall 62, this coincides with the “release” of Spacewar! 3.1, the first real final version, dated 24 Sep. 1962. (This one is basically integrating the game with the various patches, but also shows some refactoring of the object setup routine, changes to the Expensive Planetarium and a fix of the “crock explosions”.) I would think of this final integration being done by (or at least under the lead of) Steve Russell. Thank you for the kind words and detailed analysis. Your website is a wonderful resource for Spacewar information, and I appreciate you taking the time to parse my work. While I have a background in history, I am unfortunately not a particularly technical person, so I am certainly interested in your findings from dissecting the code, which goes beyond my research. I think your comment about the organization of the coding process is likely accurate. Even Levy hints at a more structured coding experience when he mentions in passing that Bob Saunders was coding right alongside Steve Russell on the initial version of the game, demonstrating that TMRC became involved early in the programming process. Graetz’s recollection that Dan Edwards asked Russell about implementing gravity and that Russell told him to add it himself also indicates that Russell was serving as a gatekeeper for new features. I don’t think this really undercuts Levy’s point about the “Hacker Ethic,” because the idea of collaborating to improve a program is very much at the core of said ethic, but you are probably right that it was an organized effort rather than the “Russell leaves program next to computer and others pick it up on their own model” that Levy and his followers imply. I will tweak the post and cite your findings in the code alongside the circumstantial evidence. On the question of memory, I assume that the “myth” in this case is derived from everyone’s recollections that gravitational effects could not be applied to the torpedoes. While I do not doubt your code analysis I do wonder about the apparent discrepancy here since unlike some of Levy’s other claims this one appears to be coming straight from the primary sources. Again, with my lack of detailed technical knowledge I may be misinterpreting something here. As for controllers, I am curious where you draw the conclusion that the controllers came along so early. The reason I ask is because the control boxes include a toggle for the hyperspace function, which would not have been incorporated into the game until around April 1962. While this could have been spliced into the boxes later (or even accounted for in the original design of the boxes before hyperspace was actually implemented since it was a long-planned feature), the idea that control boxes existed in 1961 still feels off because the primary sources seem to agree that even basic object movement was not implemented until January 1962. This is straight from the Graetz article, which I agree has greater reliability than the later oral histories. More information on this point would be helpful. 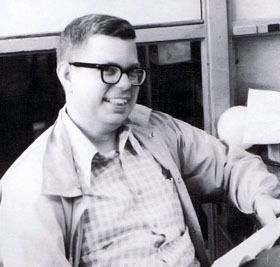 Finally, as to Russell, I think there is no doubt he was present in the PDP-1 hacking community in late 1962, but it does appear that he was not working for the university. As I stated in my post, Graetz does make that claim, but Russell’s oral history really does seem to contradict this point, though I would not consider the language therein definitive, as he does admit being somewhat fuzzy on the sequence of events (and yes, the roughly 25 year time gap between the two sources might explain the discrepancy, but the Datamation article from 1963 supports a move directly from Harvard to Stanford as well). Since Russell does explicitly state that he remained active in TMRC even while he was working at Harvard, its not too great a stretch to imagine he took part in hacking activities on the PDP-1 without working there. One interesting thing to note in this regard as well is that Russell claims that somewhere in this period he spent six months on active duty with the U.S. Army, a key chronological point that Graetz does not mention at all. This may also help explain why other hackers were taking on the majority of coding duties after February 1962. Thanks for the kind words in return! On the control boxes: I just searched, but I wasn’t able to find the references. I somehow ended up thinking that the control boxes were present, when the star and gravity were added, which would date them back to late 1961, according to Steve Russell’s oral history interview. 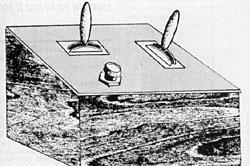 Probably more interesting here is Steve Russell’s account of a first pair of control boxes with buttons, which preceded the control boxes with levers (as depicted by J.M. Graetz in Origin of Spacewar) and no one else would remember. Moreover, there’s some evidence that there had been at least 3 other types of control boxes till mid 1963, including one with joysticks from “USAF surplus drone controllers that someone found at Eli’s Surplus” (Joe Morris). On Steve Russell’s time at the army: This actually slipped me to be significant. Thanks for pointing this out. It really explains why there wouldn’t have been any developments/improvements until fall 1962 (Spacewar 3). I always thought that they were having a “breath through” after their first achievement – and it would have been quite complicated to deal with the main program and the at least 3 patch tapes applied (with some dependencies like the hyperspace patch patching the auto-restart patch). But this provides a better explanation. On the other hand J.M. 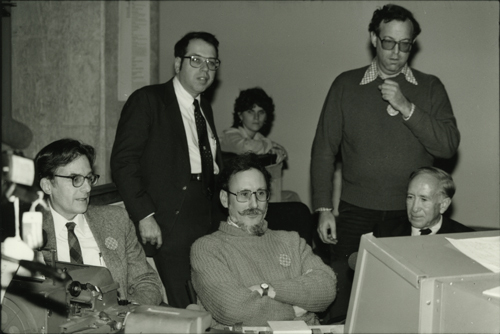 Graetz’s account of Steve Russell writing the scorer-patch just before the Open House Day in May suggests that he would have been present at MIT until early May. Regarding “Hackers” and the TMRC: It’s sometimes a bit unclear, how the relations described by Levy really were. On the one hand there would be the group of “hackers” gathering around TX-O, on the other hand TCMR. There’s probably a huge overlap, especially with the “Hingham Institute Study Group on Space Warfare”, but it’s still unclear, where the relations and bonds would have emerged. Sometimes, like in the descriptions by Graetz and Russell regarding the origin of the control boxes, TCMR-related stuff is handled more like an outside activity. Then, again, there was quite an involvement of TMRC with TX-O (as pointed out in your previous article) and there are also pictures of the PDP-1 (still awaiting its scope) setup at TMRC. Hi, I just discovered this blog and have only begun to read it but so far, I’ve enjoyed it thoroughly and found it to be one of the best and most well-researched video game history blogs on the web. I was writing to see if you planned to cover the various games that were mentioned in the Magnavox lawsuits as possible examples of prior art. There were a number of them that I’ve never seen documented anywhere else. Only a portion of the trial documents have been posted online, but in a few cases, they contain fairly extensive information on these games (if you were to obtain the other trial documents, they probably have even more information). but my focus is on arcade games, so I haven’t really had the time to look into it thoroughly and was hoping that you planned on doing so. Great work and I look forward to reading more in the future. Thank you for the kind words. I have actually commented on your blog (Alex Smith, I was not blogging back then, so I did not reference this site or my pen name here) a couple times, and we were part of a group email discussion awhile back along with Marty and Devin. I am a huge fan of your blog, which has brought to light so much of the history of the early video arcade game. Believe me, when I hit the 1970s (in about ten years at the rate I seem to post 😉 ), your blog (and hopefully by then your book) will be major sources for my own work. As to your specific question: yes, I do plan to look at the games of the 1960s, but I am not sure I will be able to dig up too much more information than your blog post. I have not begun gathering extensive sources yet, but I have found a couple of old articles and program listings related to some DECUS games and a couple of other random tidbits. I know Devin Monnens is doing a lot of research on that period (hence the paper he and Marty wrote together as discussed in this comment thread). My own research has focused more on the industry itself rather than on individual games, so I am mostly relying on the work of others for this early stuff. Still, I plan to see what I can find. Ah. I should have realized it was you when you mentioned you were doing a 3-volume work, but I didn’t put two and two together. BTW, you might be interested to know that I recently talked to one of the founders of Softape, as well as Softape programmer Steve A. Baker (I may talk to Bob Bishop as well, though his website tells his story pretty well). It has nothing to do with arcade games, but I plan on doing a post on the history of Softape. At least no one that you knew of at the time of you writing this blog post. However, Devin Monnens and myself did that very thing and Devin presented our paper/research at the Game History Annual Symposium in Montreal this past June. It was based on pretty extensive documentation collecting, interviews and surveys. It originally stemmed from the research on whether or not Spacewar! was actually at Utah during Bushnell’s claimed 1965/1966 timeframe (http://ataribook.com/book/nolan-digging-spacewar/). Upon completion of that, it begged the question of what the much larger distribution pattern looked like across the early 60s through 70s timeframe. Hence the paper. Looks like the gang’s all here! Thanks for the kind words on the blog Marty. I’m glad you and Devin ended up doing that paper. I remember you mentioning that you might do it last year when we were discussing the whole Bushnell at Utah thing, but the last time we talked about it, you were not sure you had the time. Would it be possible to get a copy of the paper somehow? LOL, I didn’t realize this was you Alex. Don’t know why I wasn’t seeing the connection. Email me and I’ll start a convo with you and Devin so you can get the latest copy. Thanks for passing along the paper. I have made a few changes to the post to incorporate your research regarding the spread of the game, with full credit to you and Devin, of course. One other quick comment. You mentioned that the story of technicians using Spacewar to test new PDP-1 installations hadn’t been confirmed by anyone at DEC.
Hi late to the party. Wanted to add some points. When was Spacewar! conceived? Wayne Wiitanen, J. Martin Graetz, and Steve Russell were the trio who conceived of it. Graetz’s May 1962 paper stated December 1961. Levy says it was Summer 1961. Graetz’s later paper and Russell’s oral interview with CHM put it after the Minskytron, and thus after DDT. DDT was composed sometime in September. There is no date on Tri-Pos or Minskytron. Wayne Wiitanen was called to service in (late) October after the Berlin Wall Crisis. So evidence strongly indicates Spacewar! Was conceived somewhere in September to October 1961 – I would lean towards October. Why the December 1961 date in Graetz’s first article? Maybe he was referring to the development of the game. I would think the 1962 paper is most reliable otherwise, considering it was written at the time. We’ve found another code printout incorporating Stars from March 25. I didn’t notice the Army Reserve note. Good eye! The DECUS article also states that you could get the code from Steve Russell. However, if he was in the reserve for six months, he would have likely been called up after the Open House based on the DECUS article and making the scorer. So that means he would have gotten out of the Reserve in November – after the September Spacewar 3.1 code is dated (doesn’t mean he worked on that one, just that it came from him). I am sure you could get information from the Army records. Russell might be able to clarify a little, too, but I haven’t heard of anything. On that note, Bob Saunders’s contributions are understated. Russell and Saunders held several marathon sessions (6-8 hours) in January and February to complete the code. Russell did most of the code, but it wasn’t just him. – Is this just a listing of the star field data, or is there more about it? On the photos of the control boxes (CHM): The pictures are probably not before 1965, since there are DEC drives to be seen in the (right) background, which originated from the LINC. It may be interesting that Spacewar! seems to have contributed to direct user input quite a bit as there are some records of control boxes first being built to play Spacewar! and then being used to brose directories and so on. (E.g. there’s a similar account by Kuhfeld about the Williams Laboratory of Nuclear Physics in Minnesota.) – Are there any other known accounts? That control box clearly wasn’t made for Spacewar. 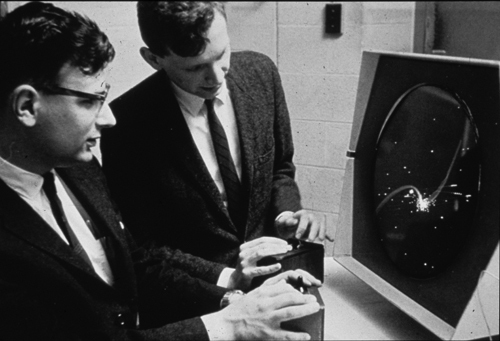 The DDP-224 at University of Michigan had a ‘joystick’ used for analyzing bubble chamber photographs. This was repurposed for Spacewar. I don’t recall Kuhfeld saying the control box was used for anything other than Spacewar. Where did you hear that? @Devin Monnens (deserthat): I’d guess the control boxes on these mid-60s photographs might have had some inspiration from the LINK (with both digital and analog controls) and might also be related to project MAC. But they illustrate well how complicated these boxes soon became.